Sen. Jabari Link, Law-G is one of 11 senators returning to the Student Association Senate this semester. Updated: Aug. 27, 2018 at 9:57 a.m. This year’s Student Association Senate will start the year with the fewest number of vacant seats in at least three years. Four SA Senate seats – two seats in the School of Nursing and two graduate seats in the Columbian College of Arts and Sciences and the Milken Institute School of Public Health – are currently unoccupied, a drop from 11 vacancies last academic year. SA senators said the cause of the high number of filled seats is two-pronged: high-profile incidents, like a highly publicized racist Snapchat post, prompted more students to push for change in public office, and freshman engagement programs attracted more first-year senators. “Everyone’s passionate about something that they want to fix, and they see that in their ideal world of how to move GW forward,” SA Executive Vice President Ojani Walthrust said. Last year’s SA officials filled empty seats by hosting Welcome Week tabling sessions in September and advertising SA applications through newsletters and social media – a time-consuming push that led to the first full SA Senate in recent years. “The more time that we don’t have a full senate, that means that the more time we don’t have all of the voices of GW heard,” Walthrust said. Walthrust said he ideally wants to fill the remaining seats by the beginning of November. But with few spots to fill, Walthrust said more students will be represented in the existing SA Senate. Senators who are not elected during spring SA elections are nominated by the senate’s governance and nominations committee and approved by the senate instead of elected by the student body. Walthrust said applications will be released online in September. Sen. Shaheera Albasit, CCAS-G, who was approved by the SA Senate to fill a vacancy last year, said that after a racist Snapchat post circulated around campus in February, more students were interested in joining the SA to voice their opinions about controversial or sensitive topics. When Walthrust ran for executive vice president, he said the Snapchat incident prompted him to run. 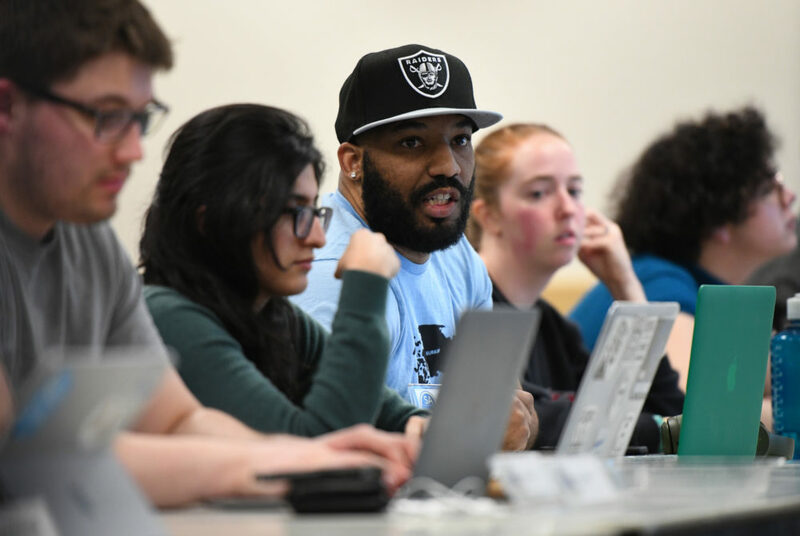 Diversity and inclusion initiatives, like a monthly town hall for students to voice grievances, were highlighted on candidates’ platforms last spring, especially among those vying for the SA’s top spots. Albasit added that a high number of returning senators was one of the main reasons for a lack of vacancies. Eleven senators, including Albasit, Sen. Matthew Ludovico, U-at-Large, and Sen. Tyler Garner, GSEHD-G, will return to the senate this fall. “I’m not sure there was ‘more’ or ‘new’ interest because there were more returning senators than there were contested seats,” Albasit said in an email. Bob Wu, the former chairman of the Joint Elections Commission – the body that oversees SA elections – said that 36 out of 38 total seats were filled after the spring election, 12 of which were write-in winners and 19 of which were students who ran unopposed. Two students who won as write-in candidates declined their appointments, he said. Sen. Amy Martin, ESIA-U, said the SA’s initiative last year to provide freshmen with mentors, who could include current SA cabinet members or senators, was a major drive behind her decision to run because she understood the inner workings of the SA before deciding to join herself. At least five students were freshmen when they ran for a position last year, according to election data. Within the program, Martin said she was assigned to work on sustainability initiatives – like the push to add Hungry Harvest, a produce delivery service, to GWorld – giving her deeper insight on the inner workings of the SA. Logan Malik, the SA’s former vice president for undergraduate student policy, was her mentor last year, Martin said. “I was on the fence about running for the senate, but after watching the change my mentor was able to instigate, I decided that I wanted to run and get more involved,” Martin said. The Hatchet incorrectly reported that senators who are not elected in the spring are nominated by the president and approved by the senate. The governance and nominations committee nominates the senators, who are then approved by the senate. We regret this error.